I wonder if you or any of your readers are able to assist with a query about the disappearance of most of the houses in Shaw’s Terrace, off Blossom street. … Recently I have been researching my family history and last week I was in York trying to locate where my Mother used to live. From the recently released 1939 register I have found that she and her family were residing in Shaw’s Terrace at that time. When I took a look at Shaw’s Terrace virtually all the terraced houses have been demolished and replaced by a rather untidy line of garages, which seem to sell for exorbitant prices. Can anyone shed any light on when and why these houses were demolished? A few years ago I wandered down Shaw’s Terrace, on my way back from a particularly pleasing walk through the Scarcroft Road allotments. 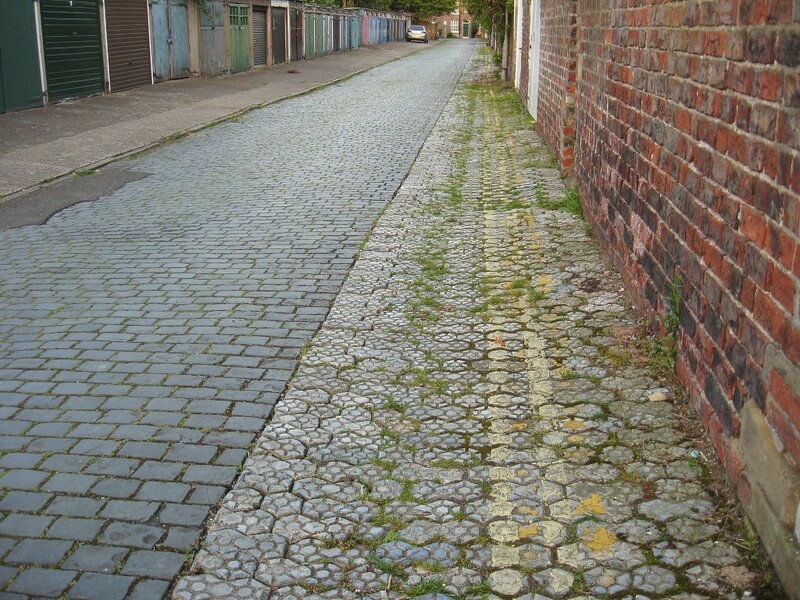 And later featured the Shaw’s Terrace paving on a page about paving. 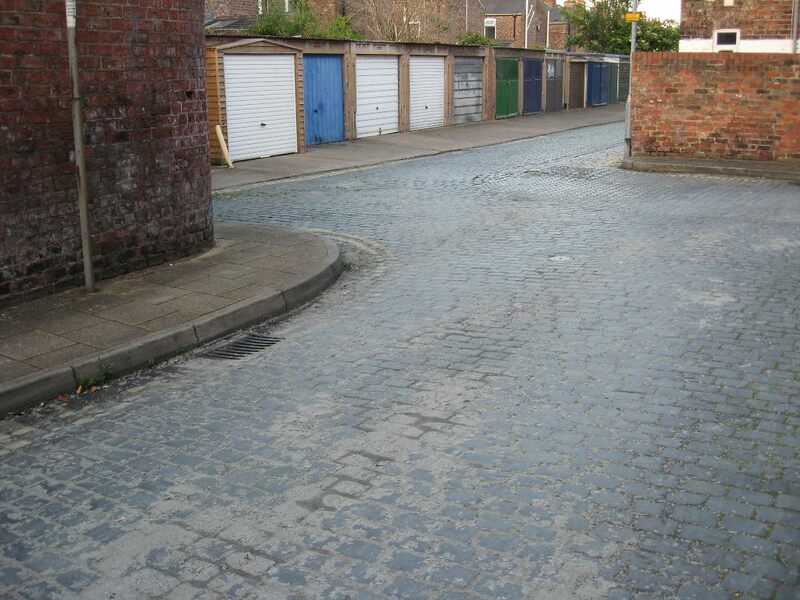 The approach to Shaw’s Terrace is either via a narrow alleyway opening off the green area around Scarcroft School, or via the wider entrance from Blossom Street, alongside the Bay Horse pub. 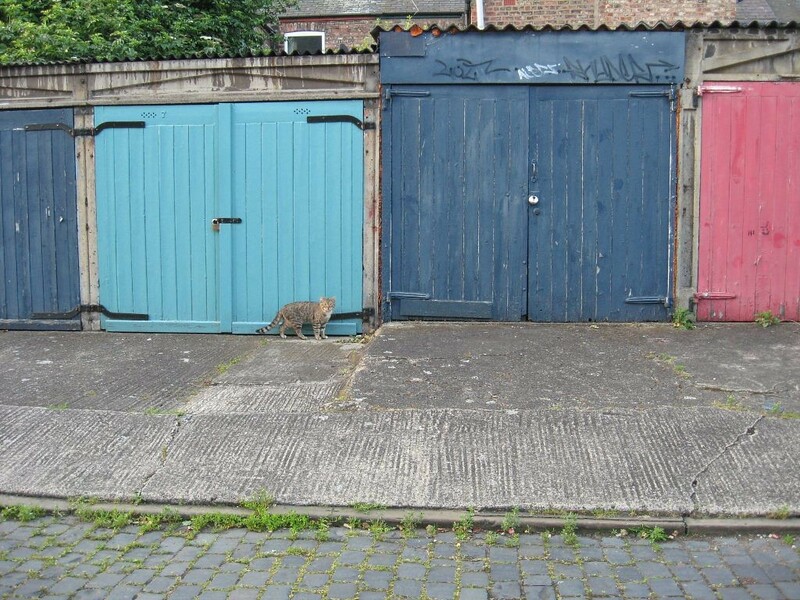 If you enter it that way you’re suddenly confronted with what appears to be a wide back alley with a line of garages on your left stretching almost all the way down to the narrow alley at the other end. A few small terraced houses are at the far end. But there were more houses down here, on Shaw’s Terrace, as Malcolm’s query highlighted. 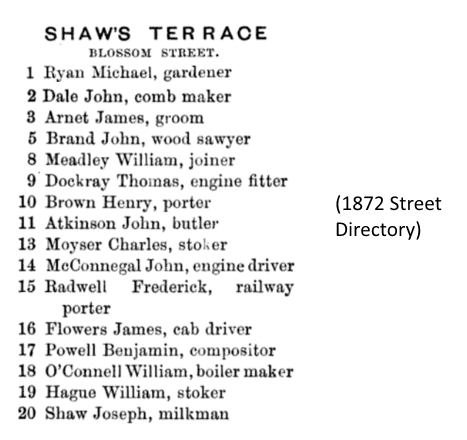 In an old street directory there’s quite a long listing for Shaw’s Terrace and its occupants. 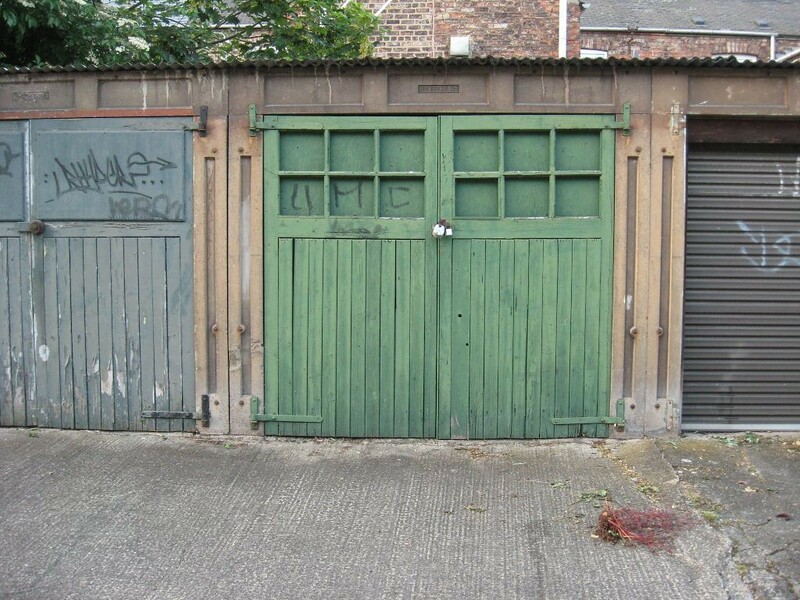 Now, in the 21st century, it does seem incongruous, and interesting, that just off Blossom Street, in such a central and desirable residential area, you turn off the main road and find a line of 20th century garages in the middle of terraced housing. Desirable garages apparently. I found them rather visually pleasing and full of character, but I’m odd like that. But apparently they’re highly valuable and sell for a lot of money, as Malcolm’s email also mentioned. 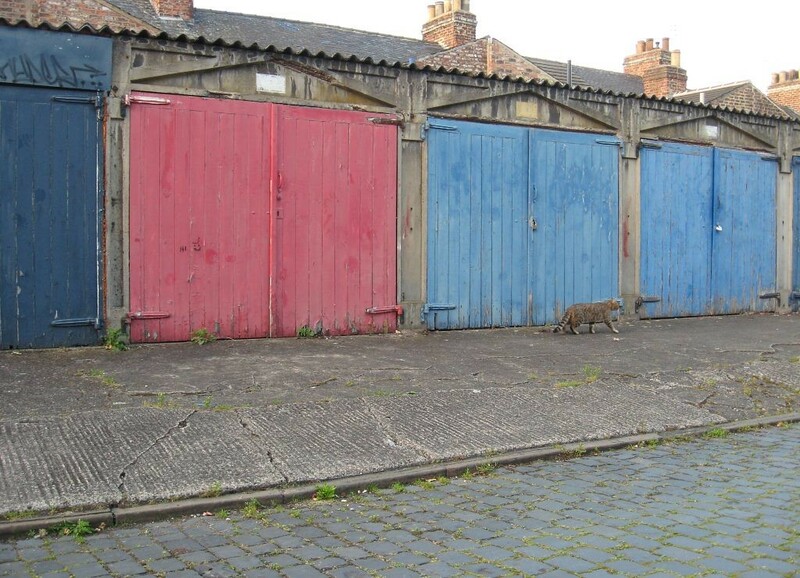 This was reported in the Press, in July 2007 in a report on the high prices being paid for any garage close to York’s city centre, with a garage in Shaws Terrace having sold for £26,500. But to go back to Malcolm’s query: when, and why, did the demolition of houses in Shaw’s Terrace take place? What did the housing there look like? It was, presumably, really quite small. Perhaps this was another of the many clearances of smaller terraced houses through the city in the 20th century. The kind of houses that are now quite sought after and expensive, where they remain. But so are garages, if they’re in the right location. By Lisa @YorkStories • 15 March 2016 Buildings To link to this page's proper location please use the > permalink. Those maps are an excellent free resource aren’t they, thanks for including the link John. 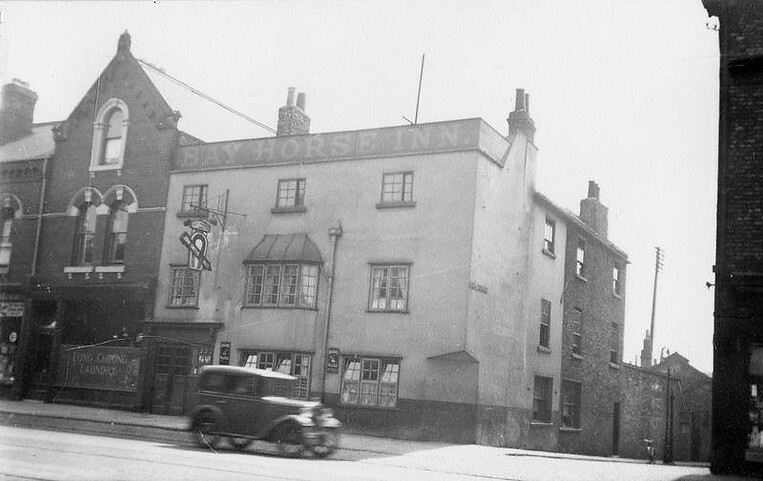 I heard that years ago there was an abattoir at the top end (where the pub beer garden / car park is now). According to someone who I spoke to last year who had once spoken to someone that used to live in Shaws Terrace in the ‘olden days’, the terrace houses had to be fumigated quite regularly because of the abattoir. I also found something online by a former Moss St resident which triangulates the story – she mentioned that she remembered her family home on Moss St backed onto it. I also heard that the houses on Shaw’s Terrace were originally built by the railway for their workers. I’m not entirely sure of the quality of the houses that used to be there, and being connected to the abattoir I imagine the whole lot was demolished during the “slum” clearances. To get an idea of their size……I imagine they were connected to the ones on Cobble Court muse so look at those. Excellent local info Alex, thanks for adding this information. Yes I think they were probably cleared as part of the ‘slum’ clearances, not sure when though, as these clearances seem to have continued through many of the decades of the middle part of the 20th century.